As a business owner, you understand that presentation is everything. If you want people to believe in the value of your goods or services, you have to present them in a way that shows how great they really are. Appearances matter in the business world, and that includes how your office looks. 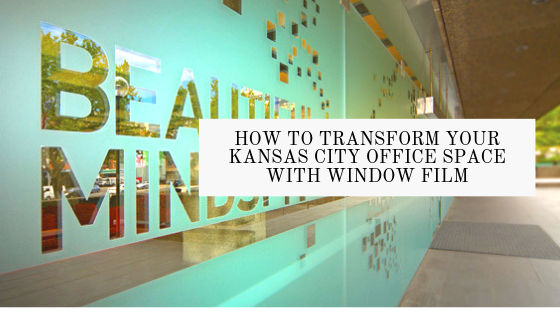 By installing office window film for your Kansas City commercial space, you can make your office look stunning and steer your business to success. Why Office Window Film, Kansas City? Have you ever walked into an office where some of the blinds are open, some are shut, and others are crooked? It looks like a chaotic mess. It’s almost impossible to maintain a clean, uniform appearance with blinds or window shades. And there’s always that one disgruntled employee who cares way too much about whether the blinds are open or closed. By opting for window film instead, you can give your office the solar protection it needs without having to deal with messy blinds or window shades. Window film filters out harsh rays of light that cause glare and solar heat gain, keeping your office environment in optimal condition year round. Office entrance – Impress your visitors from the get-go with beautiful graphics and signage for your office entry. Make your brand stand out by opting for a window film with your business name, bran colors, or logo. Speak to an expert about your office design needs today. Call Scottish Window Tinting to schedule a consultation and begin exploring office window film options in Kansas City today.